Is travel on your 2019 to-do list? It should be, because each year becomes the best time to travel. Why? As technology evolves, there’s continually a new series of inventive apps that bring about more information than you ever had before. Nowadays, your smart phone or computer devices are your ultimate travel tools. For traveling locum tenens professionals, these mobile devices do more than help you stay in contact with friends and family while out on a job assignment. Whether you need to find a good eatery or a place to stay, the touchscreen in your pocket can make life in an unknown city substantially easier. We’ve rounded up our top five picks for best travel apps. With PackPoint, you’ll be told to pack. The app shows you what to bring based on the length of your trip, the weather in your destination, and any activities you’re planning along the way. If you’ll have access to laundry facilities in your destination, PackPoint even allows you to account for washing your clothes and wearing them multiple times. Look hundreds of miles ahead and discover great spots at approaching exits. Food, hotels, gas – it’s all there. Whether it’s your favorite eatery or any business with wifi, iExit will tell you what exits ahead have precisely what you need. The iExit app contains over 2,500 nightly hotel deals with rates cheaper than you’ll find anywhere on the web. TripIt arranges all your travel itineraries and documents so you have everything in one place before you even get to your destination. 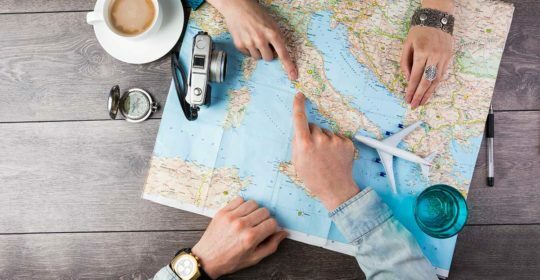 Just have your reservations automatically sent to TripIt, which will let you view travel confirmations, flight itineraries, tickets, hotel, and rental car in one easy place. The app also makes it simple to share your trip plans with anyone in your contacts. Evernote is comprised of the tools you need to stay systematized across all your devices. Save a note to Evernote on your iPad and have the same one downloaded directly to your phone. You’ll never go without any elapsed information again. Field Trip has everything from local history to the best places to shop, eat, and entertainment. While running off the location on your device, one can select from local genres of food, with information about each eatery popping up in your area. It will even notify you when you get close to something interesting. With the use of Bluetooth, it can even read you the information.